Installing an alarm system is no big deal especially when you have experts like Serious Security to assist you. But there’s no harm in being coached on where you should place the different components of your alarm systems after you’ve bought the system. Placing the different components in the right locations will enhance the operational efficiency of your system. The control panel occupies a central position in any configured placing of the alarm system components. It is where all the signals converge from the other gadgets such as the detectors and the code pad that are placed in the house around the central control area. It is right therefore that it is placed in a centralized place in the living room area where it can be easily accessed and operated. Motions that are captured by the detectors are automatically transferred to the control centre where they are processed for setting off the indoor and outdoor sirens and the strobe light. The keypad, with its digits and symbols portray the number and kind of functions that the system touts that make up the entire functions for the system. It can act as the arming/disarming function of the entire system. It can sometimes as a secondary arming function while the control panel is silenced for the night. In this capacity, the keypad will enable the whole system to function on a perimeter protection mode so that the entire house is protected from thieves all through the night. This extra function of the keypad will help keep the system on if the central panel fails to function. The movement you are interested in with an alarm system are of course those that happen within the house and the detectors should be placed within the vicinity of places that are likely to occasion movements. Make sure the detectors are pointed inward towards the house interior so that any unwanted familiar during the night can be detected, reported and alerted. Never point them at heat emitting appliances otherwise the extra heat will activate the system. The sirens and strobe light should be placed at the front entrance for maximum effect. Selecting and installing your system components is a job our professionals can do best so ring us on (02) 8734 3250 for our free quote and we will position your system’s components where they will be most effective. 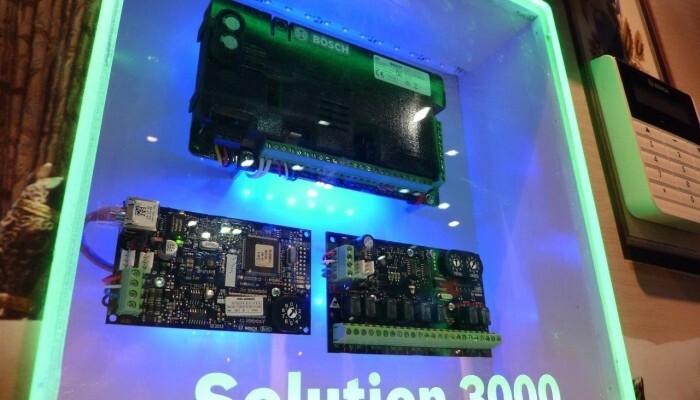 Bosch Security Systems has released its new Solution 2000 and 3000 alarm panels which are designed to expand and handle evolving automation and communication modules in the future. While offering the same telephone line communication capabilities as existing intrusion panels, the Solution 2000 and 3000 also have available a range of communications extension modules that integrate directly with the panel and provide options such as mobile communications via the GSM and GPRS networks, along with IP reporting through the Internet. Bosch Remote Security Control app gives users full control of intrusion panels through AndroidOS or IOS smartphone. The kind of electronic networks that manufactures of tech products are making these days are simply amazing and that also goes to Bosch’s new alarm panels that are now on the market. At Serious Security, we have noted this development and note with awe what these panels can do. They look far ahead into the future and try to make networks more efficient and easier to use by customers that want to avail themselves of the services these panels can provide. More important, they are extremely affordable and flexible for adapting to future advances in technology. Even with the plethora of buildings these days that have been built according to new architectural designs, the trend shows that future designs will move towards very tall, streamlined and harmonious structures. These structures will need more sophisticated types of communication networks that will need the very panels being produced by Bosch. The company maintains that its panels are flexible to such an extent they can be adapted to accommodate any change in lifestyle, in the connectivity required and the degree of rapid expansion that will be part of the future. As if the qualities of the panels alone weren’t enough, Bosch has thought of producing other additional features alongside the alarm panels. More expansion functions will be added to the panels in the next few months and they will definitely add to the glamour and popularity of the new technological wizardry. Installers and users alike will be brought face to face with the potential utility of the products that will open other windows of opportunity for further expansion. For instance, the new modules will feature the integration of video and home automation into existing networks. The controls for the modules are exemplary works technological achievement shrouded in metal casings that exhibit a very compact look. There are termination points surrounding the outside of each module that are tagged, making it easy to navigate and difficult to lose direction at the same time. The tagged terminals make it virtually impossible for a user to fumble and lose track while performing several functions or a single function at a time. With these kinds of features decked all over their outer casing, targeted markets are sure to welcome their appearance. If you want more information on the mentioned panels, ring us now on (02) 8734 3250.